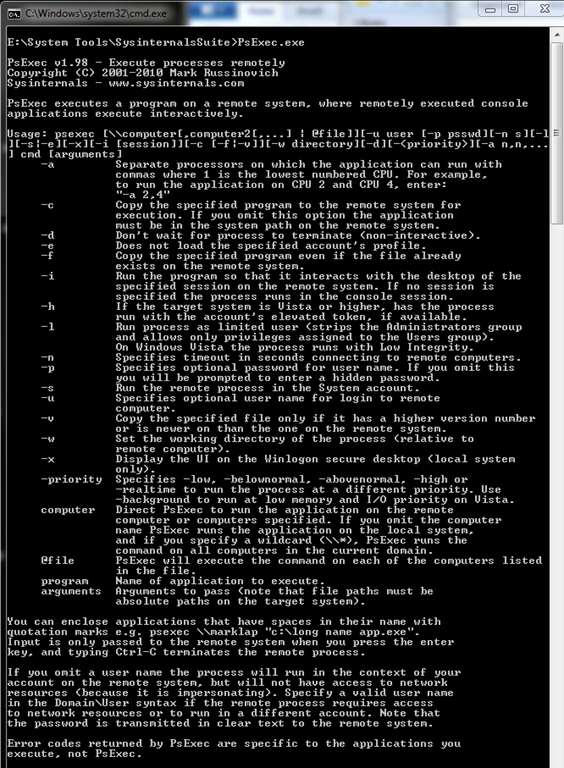 As usual, I was searching something over internet and going through random crap to look for something (I don’t remember now what was that) and I somehow found that there is really great utility available in good ol’ Sysinternals Suite which literally allows user to remotely execute any application on another machine !! That utility is called PsExec. Honestly in past sometimes I really had wished that if there is some kind of tool available which can run some program on remote machine so that I don’t have to do something crazy. But I always assumed that it simply is not possible for whatever reasons and so it crossed my mind to even search for something. Few days back I was working on a script to automate project builds. And at one step I was required to checkout code from source control and build the application. Since everything was done using a single script there was no way I could prompt to user GUI because in this case it was just a plain PowerShell script. After bit to experimenting and Googling, I was able to find a solution that fit my need, but then I thought to use same script as a batch script (of course with some modifications) and I was surprised to see that many commands in PowerShell are declared and used differently then what we normally do in batch script. That was same case with SVN commands. 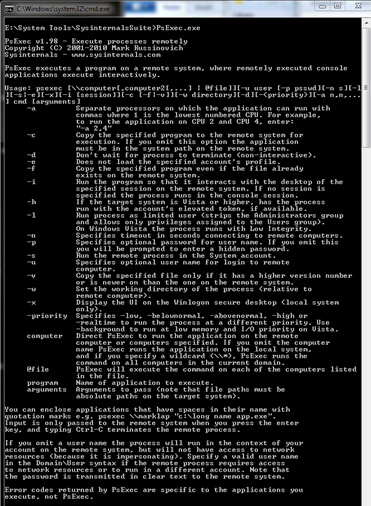 I use Tortoise SVN for both work and myself, so I am showing this using it. But if you look at help file it is clear that Tortoise SVN is more like a GUI tool not something that can be used via CLI, in fact it is even recommended by author himself to use Official SVN tools instead of Tortoise SVN. But lucky for us, Tortoise SVN already includes official SVN tools !! You can find them at “%ProgramFiles%\TortoiseSVN\bin\”, it includes exes like SVN, SVNAdmin, SVNLook, SVNVersion etc. If they are not there then most likely they are excluded during installation (which is default installation choice). So just grab installation EXE from Tortoise SVN site and run installer again to install these tools. So, by following few blogs, MSDN helps and forums … I was finally able to install and configure everything properly … I had working domain too … but when you try to setup windows cluster, it is recommended by MSFT to validate cluster before setting it up. Which basically runs bunch of tests like check all nodes, their hardware, their compatibility, storage system, network settings etc … and if any test fails then you have to fix that issue before setting up cluster. And if you are not too savvy about these items then it is really painful experience. So when I tried to run this test .. it failed at one particular point where it validates system configuration. Unfortunately I don’t have screenshot of this error so I can’t show detailed message but it had something to do with system settings. I tried to look for this error and I was not able to find any definitive answer until I found an answer in stackoverflow which mentioned that it could be because of SIDs ! I know that in recent times, I am kind of feeling more sensitive towards users experience in general, weather it is @ customer support for any item or @ email system … or this time @ one of my favorite download site (at least it used to be but not anymore). For years I have used Download.com as my download site for windows application. Time to time I have used even reviews from CNET to lean about new/existing software .. but my recent experience has left a bad test in mouth to say, and I think I will not download from them ever . Till now, when ever you want to download from this site all you had to do was to just search for that software, download it using link provided by the site and install the software. But today when I tried this site to download “Revo Uninstaller” (an uninstaller application) instead of getting simple EXE, I got a custom installer designed by CBS Interactive (owner of CNET), it even has digital certificate from MSFT too so it “feels” more genuine. But I think it is wolf in disguise of sheep (I am not sure about analogy but I guess you got the point). 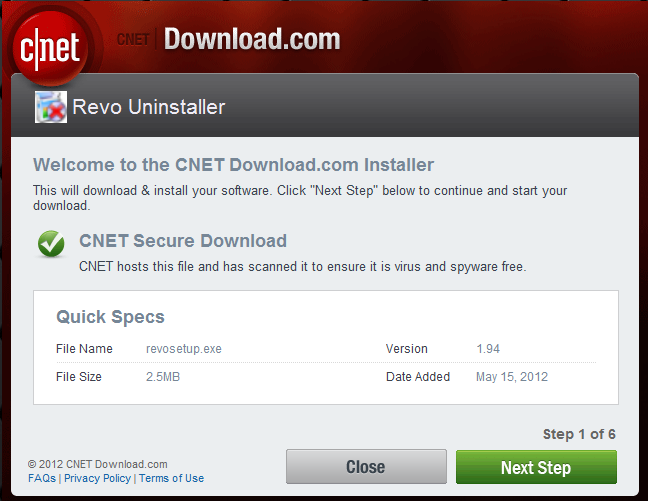 First step is to indicate that I will be downloading and installing Revo Uninstaller. This great feature was introduced in SQL Server 2008 and since then it has been considered as one of “standard” method to administer database proactively. As the name suggests, it allows DBAs to create various policies to enforce certain rules to single database, to group of databases or to whole server… for example default database backup location has to be some particular drive or every new database has to be in full recovery mode or each SP that are created and that will be created has to have prefix “USP_” etc. It is very common issue of collaborative database development that developers like to keep follow their own naming convention then industry standards or MSFT recommendations for database objects. And they usually choose proper names for any objects they create, based on function / purpose of that object. But sometimes they like to choose name which could effect how SQL Server Query Execution planner behaves and you might see performance impact. For example in case of Stored Procedures, use of prefix SP in front of the stored procedure name. Now, I am not an expert in performance tuning but I know basic thing that it causes Query Execution planner to look into system stored procedure list at first because SP keyword is reserved for system stored procedures. Policy Based Management (aka PBM) is made of 3 components. Facets, Conditions and Policies. And the order it works is, you use existing facet in condition and based on that condition you create a policy to be implemented on either single database or whole server. All details about time and session and registration can be found on SQL Saturday website.